Coach McDermott announces that for the home opener the team will wear blue jerseys with no pants. Team mascot, Billy Buffalo, is found reeking of peppermint schnapps in a Batavia motel room with the Philly Phanatic. Kyle Williams, one week after watching the solar eclipse, retires from the team citing he’s drawn to making astronomy his life’s priority. Marcell Dareus, while attending a Bison’s game, suffers a season-ending injury during the 7th inning stretch. Minutes from opening day kickoff Bills players still can’t access team locker room due to plumbers still trying to fix shower drain clogged from guitarist Slash’s hair. Team is sued after fan goes blind watching the solar eclipse through One Buffalo sunglasses. Doug Allen, while making a special appearance, sits while singing the national anthem. 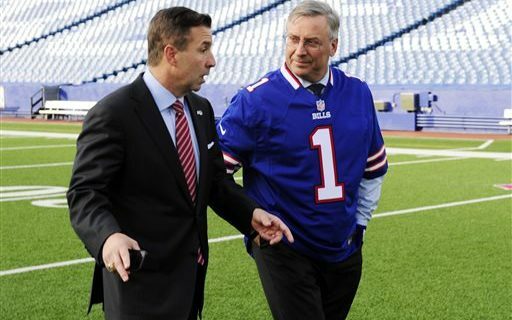 Much to the disappointment of RV owners lodging overnight in the stadium’s camper lot Terry Pegula will no longer lead Sunday morning interpretive hikes exploring local wildlife habitats. Desperate for any good news the team issues a press release hailing its depth at the place-kick holder position. During opening day’s national anthem the equipment intern’s ankle bracelet goes off. Team drops Nike as its uniform designer in favor of Jaclyn Smith. Terrell Owens threatens that unless he’s added to New Era Field’s Wall of Fame he’ll give a duplicate key to the city to Dennis Rodman. Click here for more of Jeff’s humorous sports observations.